When his stage-magician family vanishes for real, can Balthazar find them? 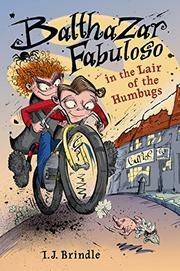 The Fabulosos may perform on stage, but they also have real magic…all except Balthazar; he’s normal, and he wishes his family were. Hoping he will blossom late, his parents are positive and encouraging, but they are wrapped up in the family business. At a Christmas performance at the dinner theater where they work, they are heckled by rival magic family the Fistulas—and they disappear. A social worker leaves Balthazar with his wayward uncle, Ignatius. When the Fistulas disappear too (after taking over the dinner theater), their magic-using daughter, Pagan, joins the hunt for the missing magicians. Evidence mounts that someone is using anti-magical Gloaming, but will the International Brotherhood of Real Stage Magic help, or is the trio on their own? With references above the ken of the target audience and a few plot missteps, scriptwriter Brindle’s debut fizzles like damp magician’s powder. Balthazar is a passable Everykid, but the world around him never jells, nor is the tension tense. Pagan’s occasional between-chapter “Log Entries” are unfunny and unnecessary. Judging by Walker’s illustrations, the Fabulosos and Fistulas are white.